The iPad Pro is the latest and greatest tablet on the market, and you can win one of your very own. You’ve been eyeing up the iPad Pro since the day it was first introduced. Today could be your lucky day, as we’re giving away an iPad Pro to one lucky reader. Enter our iPad Pro Giveaway to get yourself in the running to win! The iPad Pro is one of Apple's finest feats of technology and engineering. The thin and lightweight tablet is easy to take anywhere, but Apple has still managed to pack the device with unmatched power. With its 64-bit desktop-class architecture and 10X Fusion chip, it’s ready for the future of computing with the processing speed of most desktop computers. It's the perfect tool for any creative on the go. 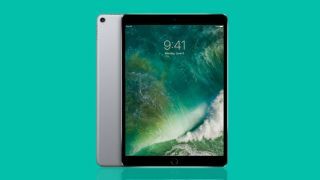 The iPad Pro 10.5-inch retails for $649/£619, but you can enter for your chance to win one for free! All you have to do is enter the iPad Pro Giveaway by signing up and clicking the “Enter Now” button. It’s as easy as that!